Prototype: 6 different design German State Railroad DRB express train passenger cars. Model: The cars are detailed and full length for the scale. They have underbodies and trucks specific to the car types. The coaches have numbers for their position in the train and train destination signs. The 7319 current-conducting couplings or the 72020/72021 current-conducting couplers can be installed on all of the cars. Interior lighting kits can be installed in all of the cars. The mail car comes with factory-installed lighted upper marker lights at one end. Total length over the buffers 149.2 cm / 58-3/4". Express Train D 12, train route Berlin - Stuttgart. Mail car includes lighted upper marker lights. All of the cars are full length for the scale. 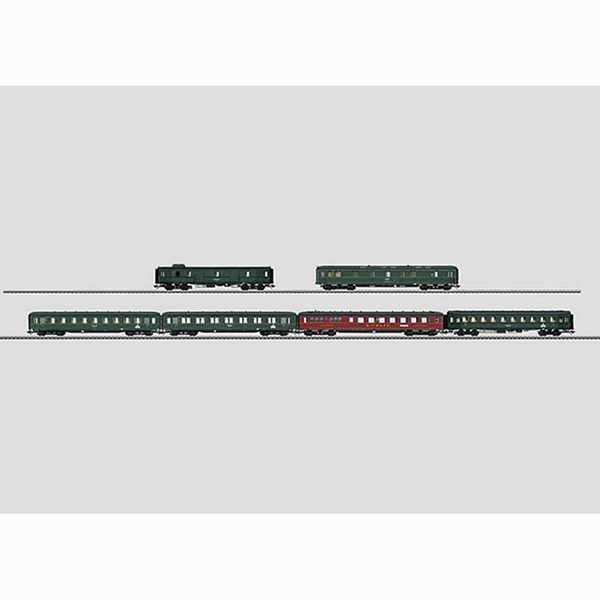 This express train passenger car set is being produced in 2014 in a one-time series only for Insider members. The class 05 streamlined steam locomotive goes well with this car set and is being offered under item number 39053 exclusively for Märklin Insider members.